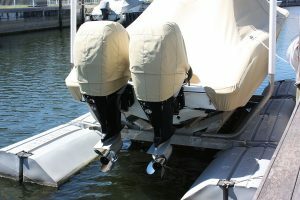 In addition to boat tops and enclosures, AmeritexDirect supplies many boat builders with smaller, miscellaneous covers. Should those items wear out, and almost everything does over time, AmeritexDirect is more than happy to custom manufacture new, exact replica replacements of your seat covers, steering wheel cover, motor covers, or any other item that we originally provided for your boat. You can find out if we made miscellaneous canvas parts for your here.